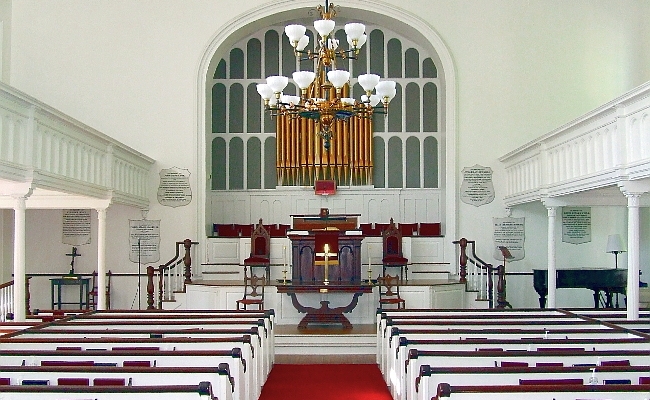 A variety of spaces are available at the First Congregational Church for weddings, concerts, meetings, and other events. All facilities are handicap accessible (with the exception of the sanctuary balcony). Please contact the church office at 413-298-3137 with questions or to arrange an appointment to tour our facilities. The historic, sun-filled sanctuary of the First Congregational Church is a classic venue for couples planning the quintessential New England wedding. The sanctuary can accommodate ceremonies both large and small (seats up to 400 including the balcony) and is equipped with a Steinway piano and Johnson organ. Additional rooms offer private space for the wedding party to gather. The church is open to couples regardless of membership. The Pastor of the church will meet several times with the couple to plan the ceremony, discuss the meaning of Christian marriage, and engage in pre-marital counseling. The church will provide an accompanist to play the organ and/or piano for the occasion. As an Open and Affirming congregation, the church is open to couples regardless of sexual orientation, gender identity or gender expression. In addition to our Music on Main concert series and serving as home to the Stockbridge Festival Chorus, the church hosts numerous concerts, both large and small, throughout the year. With excellent acoustics, a Steinway piano, Johnson organ, and a multi-tiered stage, the sanctuary is an ideal performance venue for solo recitals, small orchestras, choirs, and other musicians. The ground level and balcony combined seat up to 400. Space is available to rent for both one-time and regular meetings in the Sanctuary (seats up to 400), Jonathan Edwards Room (ideal for receptions or small lectures), and classrooms (ideal for small to medium meetings).